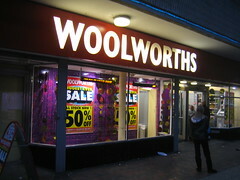 Woolies’ collapse in November took with it its nascent music downloads business Woolworthsdownload.co.uk. The online store, which was strengthened alongside Woolies’ near-total exit from physical music retail, was powered by Entertainment UK, Woolies’ CD and DVD wholesale distribution unit, whose own demise put paid to Zavvi but which also served digital downloads. The download shop, like its high street counterparts, is now out of commission – but could Shop Direct’s new online strategy bring it back… ? A spokesman for Shop Direct would not confirm whether downloads will be part of a new Woolworths.co.uk — “The ink’s not even dry on the deal”, he says — but paidContent:UK understands Shop Direct is in talks over the future of the download service. No response so far from Woolies administrator Deloitte, which is busy selling off its hundreds of empty shops across the country. Shop Direct CEO Mark Newton-Jones told BBC Radio 4 this morning the site will sell all the things Woolies was famous for, including “entertainment”. But, with Woolworths and Zavvi having been hit by falling demand for physical entertainment, a re-emergence in to digital downloads, which aren’t beset by real-world distribution problems, seems likely. Two sticking points: 1) Not even Zavvi has been minded to rescue its failed download store. 2) Can a Woolworths digital music play really ever compete with the likes of iTunes? Sports Direct may get to find out: Woolworths.co.uk today asks users what they would and wouldn’t like to see in a revamped site.